Restuarant and bar serving delicious meals. 3 swimming pools, 2 are for kiddies. Just 2km from Etosha's Anderson gate. Located in a private reserve. Nestled in green and gold Mopani forests, Etosha Village manages to combine affordability with comfort. Located on a private reserve, adjacent to Etosha, near Okaukuejo, this traditional tented safari camp effortlessly combines nature with the all the comfortable touches to enable you to enjoy your stay. There are 40 canvas suites on raised wooden decks. Each has a fully air-conditioned bedroom with twin beds and a sleeper couch, and a semi-open en-suite bathroom. There is a private patio at the front allowing you to relax in relative privacy and enjoy the natural surroundings. (They are equipped for self-catering too!). In addition to the comfortable accommodation, Etosha Village has a restaurant with a choice of three restaurant seating areas. Breakfast and dinner are served buffet style and lunch is à la carte. The popular bar serves ice cold drinks and is a great place to meet and chat with fellow travellers. The sparkling pool with separate kiddies pools is a star attraction in the heat of the afternoon. Conscious of the limited natural resources in the area, Etosha Village works hard at water conservation and recycles water. They also have their own veggie garden supplying the restaurant with fresh produce. Most of the staff employed at Etosha Village are from the surrounding area. Open: Etosha Village is open all year. 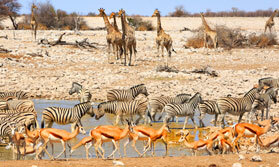 Location: The camp is located just 2kms from Andersson's Gate, Etosha National Park in northern Namibia. Rooms: There are 40 tents with en-suite facilities, they also have an outdoor seating area and separate 'kitchen' tent. The adjacent campsite completes the accommodation offered here. Activities: The camp offers game drives into Etosha National Park. Facilities: There is an restaurant with different seating areas, a bar and three swimming pools. There is also a small shop selling supplies and curios. Children: Children are welcome at Etosha Village. Communication: Internet is available at the camp.